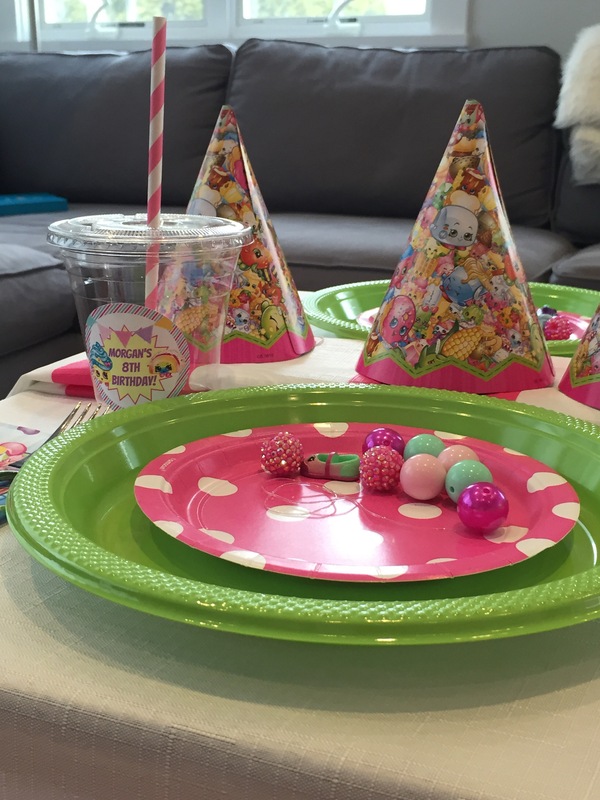 Well the Shopkins craze hit our household last year and of course Morgan requested a Shopkins party! 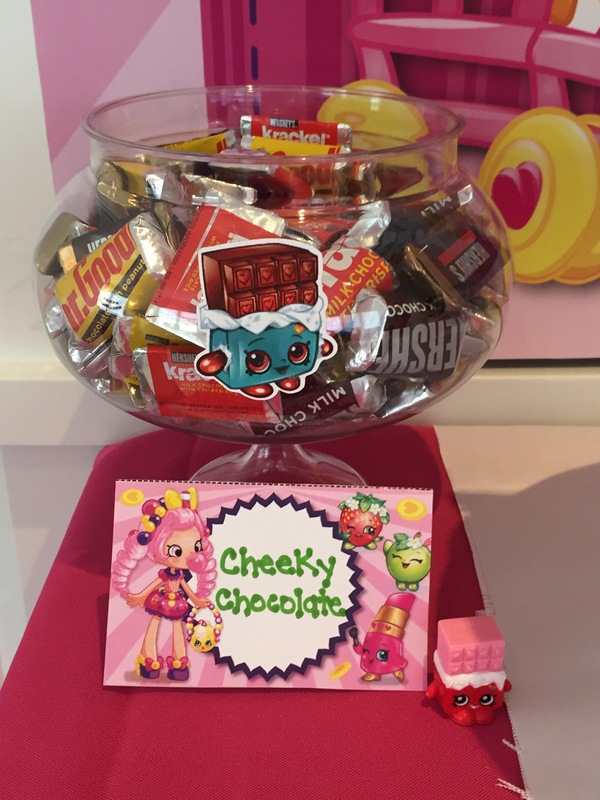 Shopkins are just the cutest little things. 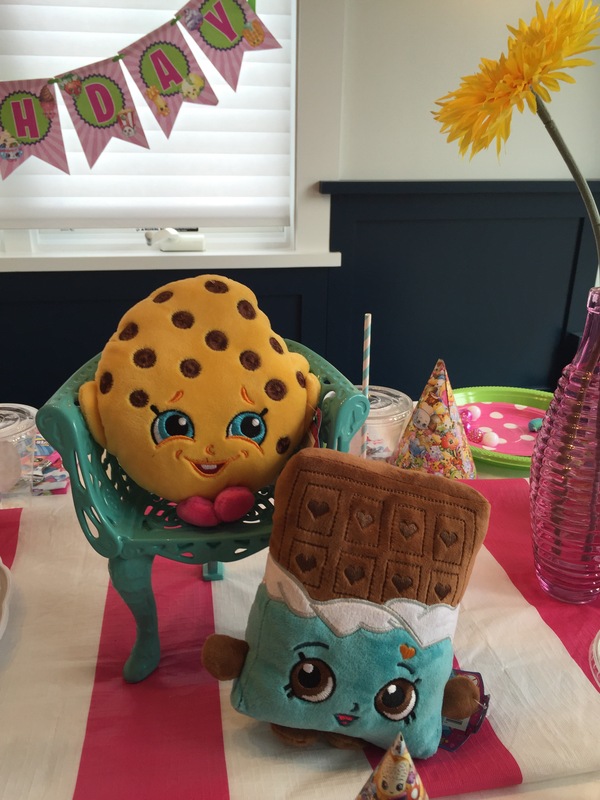 They are tiny collectible toys based on grocery store items and they have the cutest little faces and unique names. 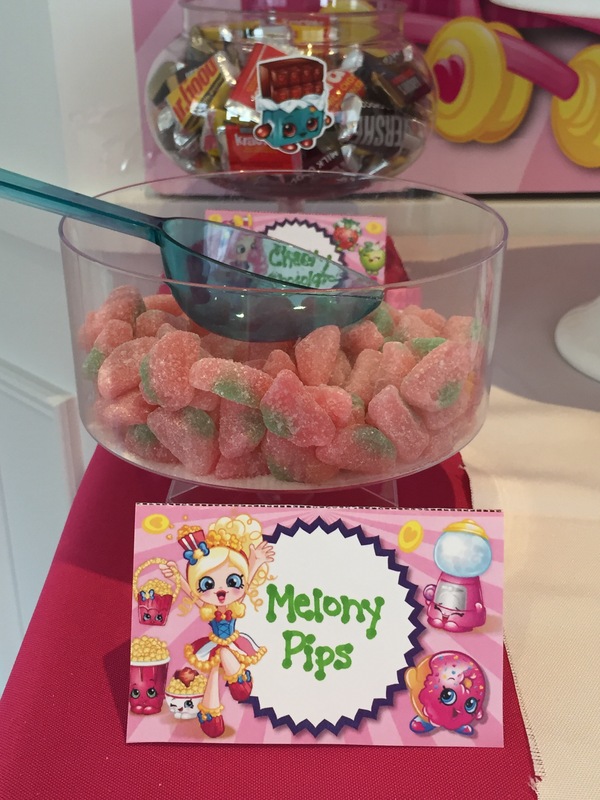 I would have totally collected these as a kid! 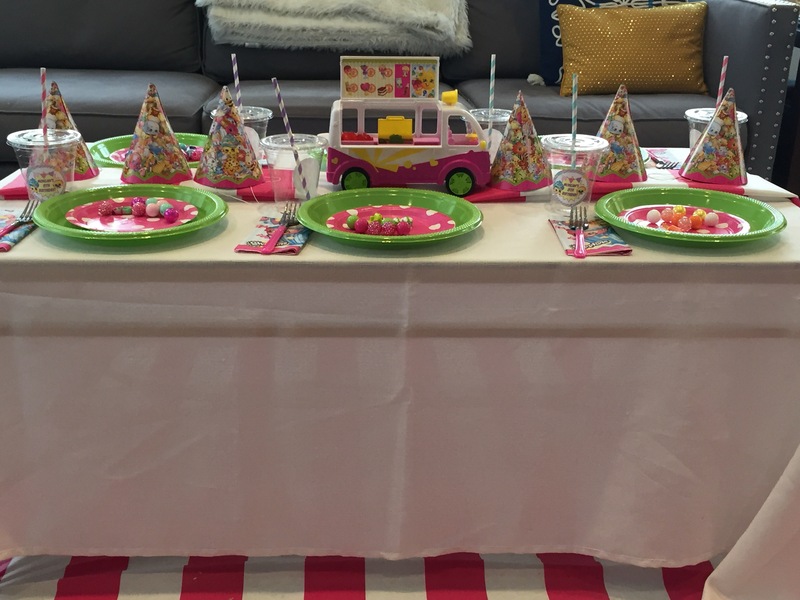 Okay, let’s start with the main party feature- the cake table. First, let’s talk about this background! How awesome is that? I bought the printable design on Etsy (seller no longer available) and had it printed at Staples to the exact dimensions of our entertainment unit (our TV is behind there!) 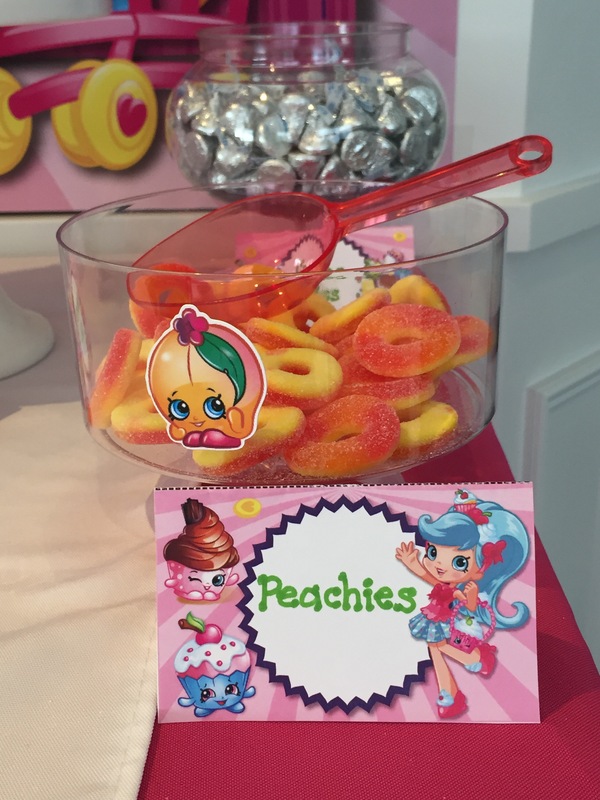 The printable food tents were from the same designer. I used my favorite fushia tablecloth found on Amazon and cut triangles from an old white tablecloth to layer on top to resemble a receipt. 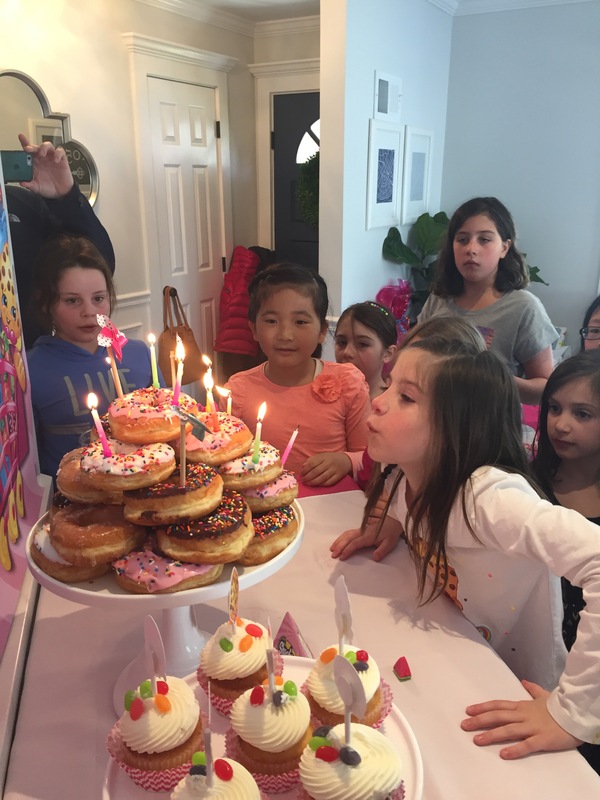 Morgan requested doughnuts this year instead of a cake. 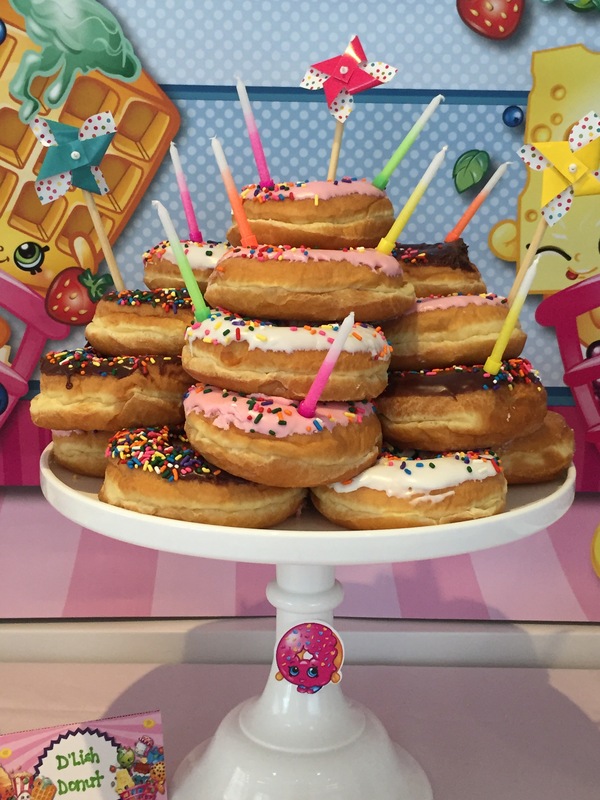 I picked up some frosted doughnuts from Dunkin’ Donuts and stacked them on a cake stand. I think it resembles a cake and no knife was required! 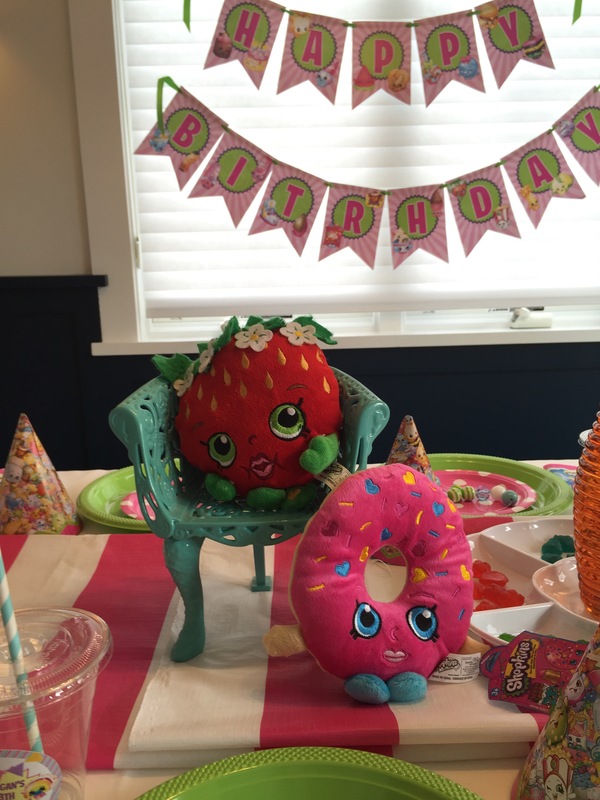 There is a Shopkins character named D’lish Donut so this fit perfectly with the theme. 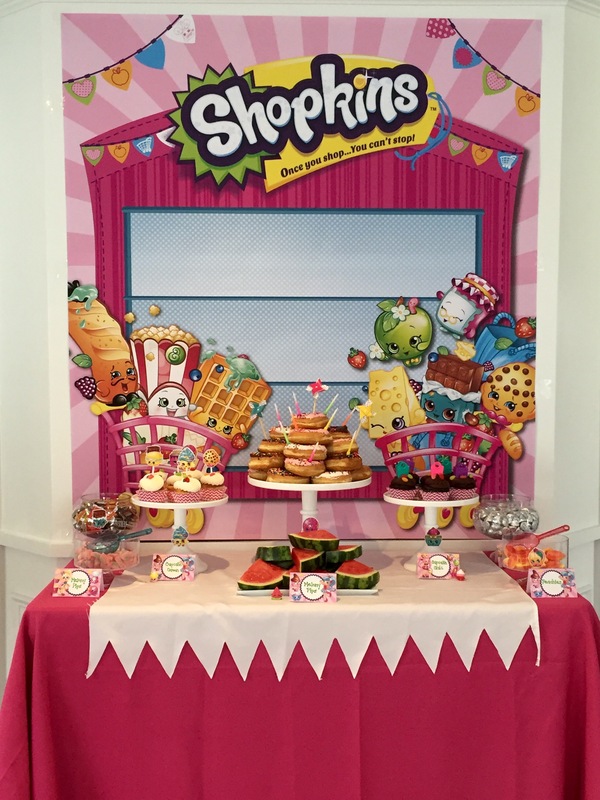 We chose other treats for the cake table in the name of other Shopkin characters. 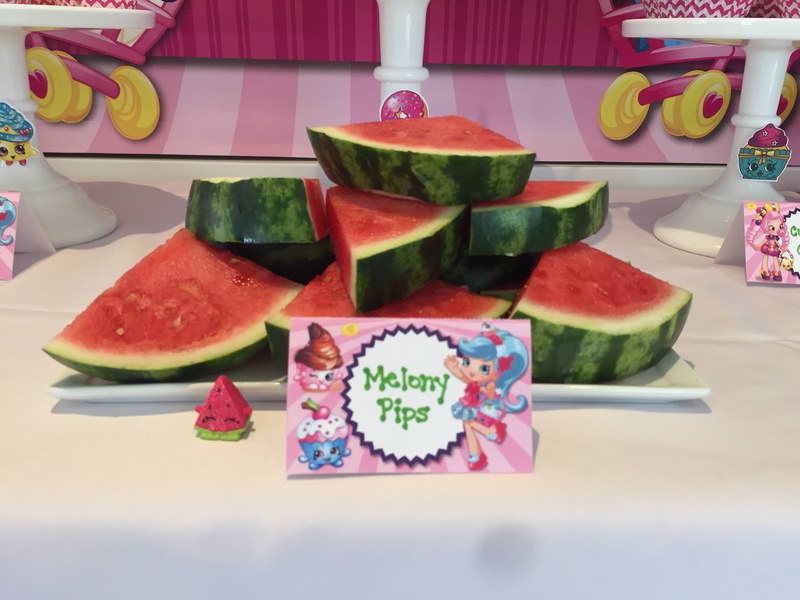 We had cupcakes for Cupcake Chic and Cupcake Queen, Peach Rings for Peachie, Hershey’s Kisses for Choc Kiss, mini chocolate bars for Cheeky Chocolate, and fresh watermelon and watermelon gummies for Melony Pips. 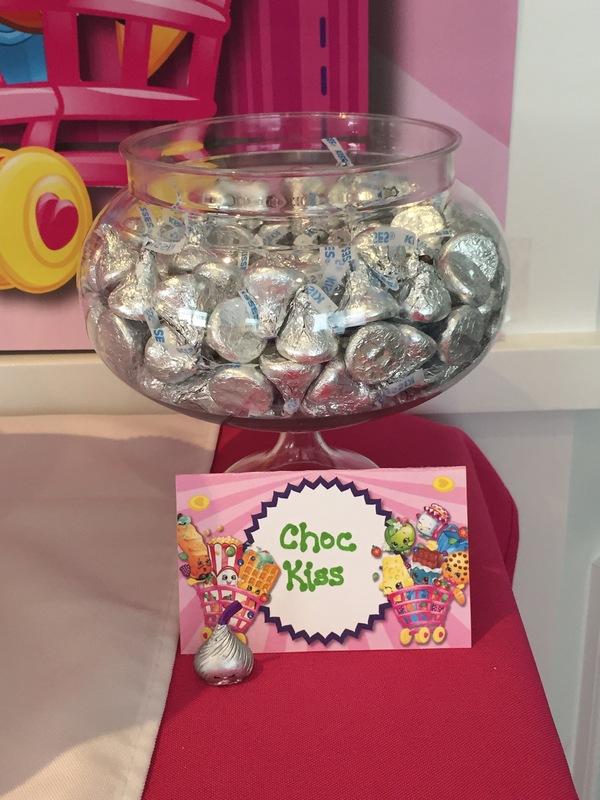 The kids went wild for the candy! 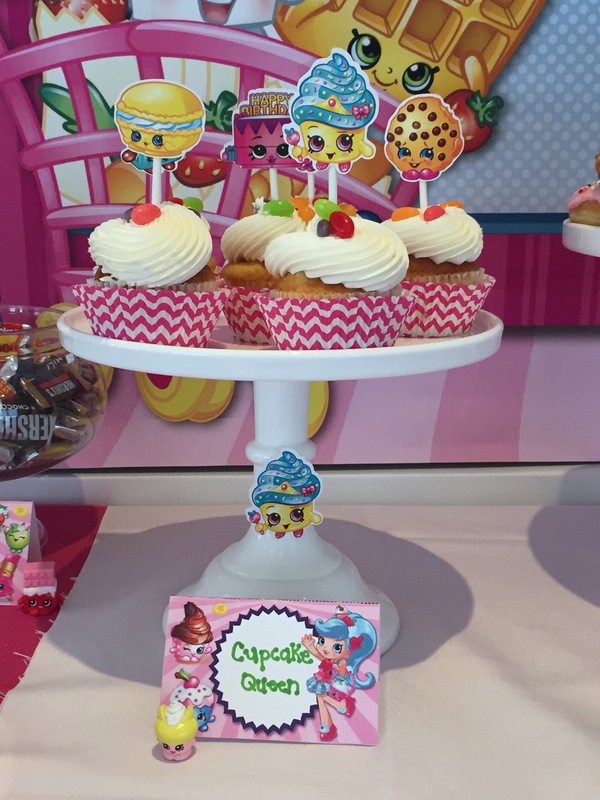 I used some of Morgan’s Shopkins to decorate the table and also the mini shopping bags on top of some the cupcakes. 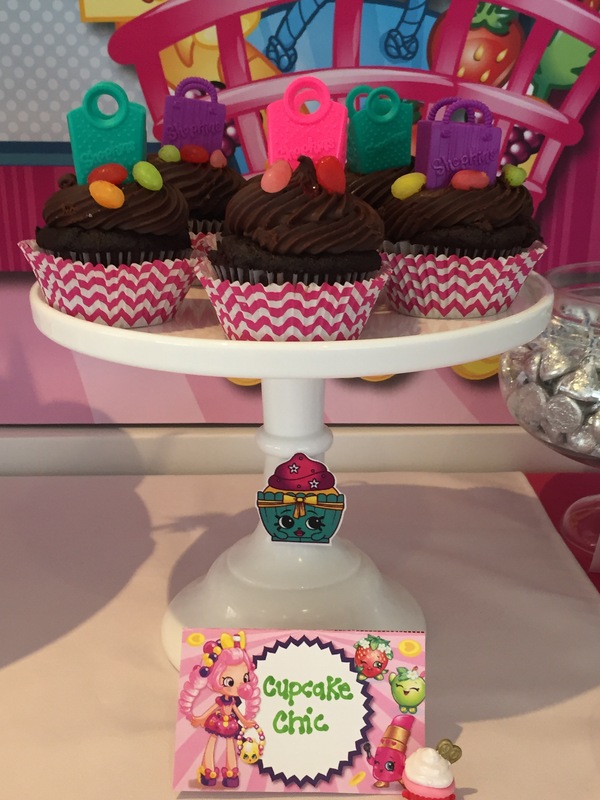 The other cupcake toppers can be found here. 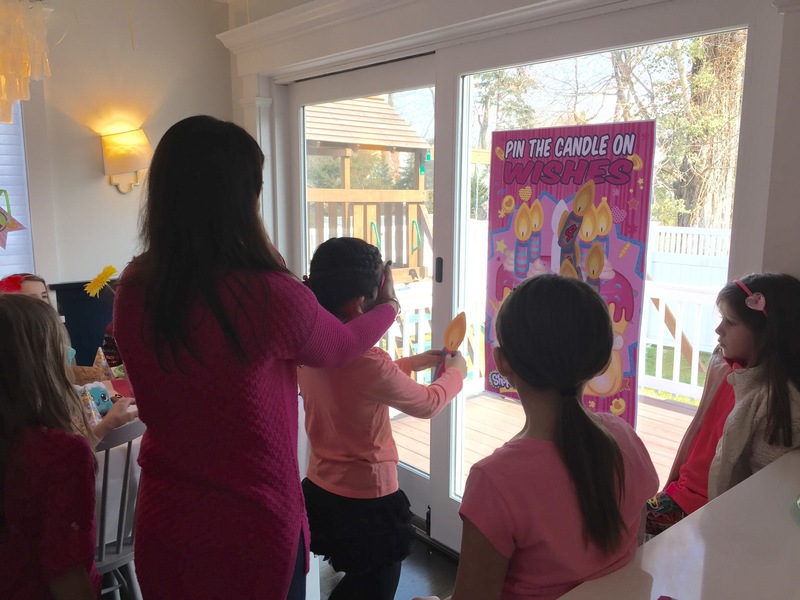 This was a two hour party so I planned a few Shopkins related activities to keep the birthday girl and her guests entertained. 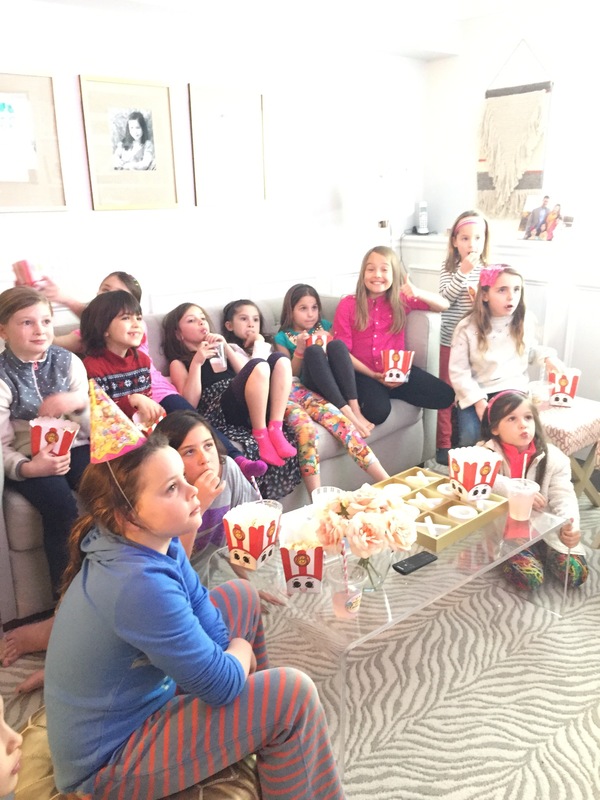 The girls came in and found a seat at one of two tables. 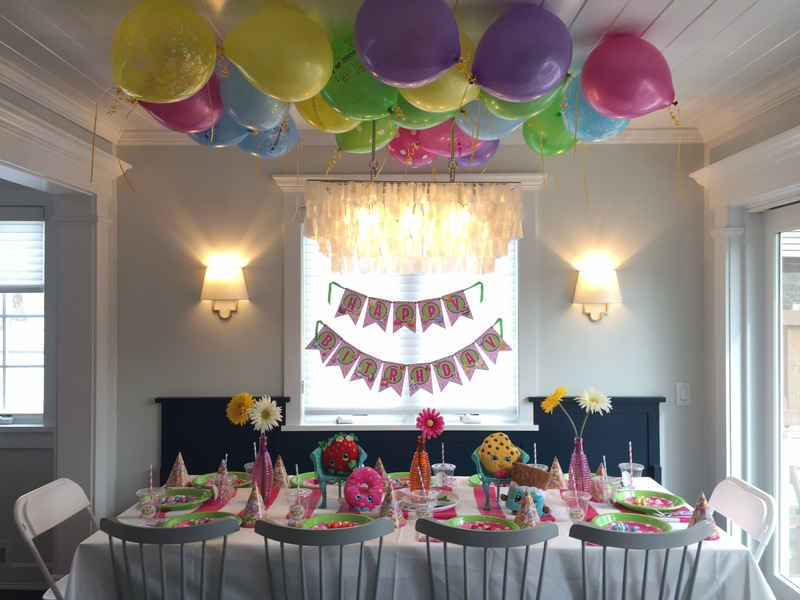 I used a few of Morgan’s Shopkins toys to decorate the tables and I love using balloons on the ceiling to bring color to the space. 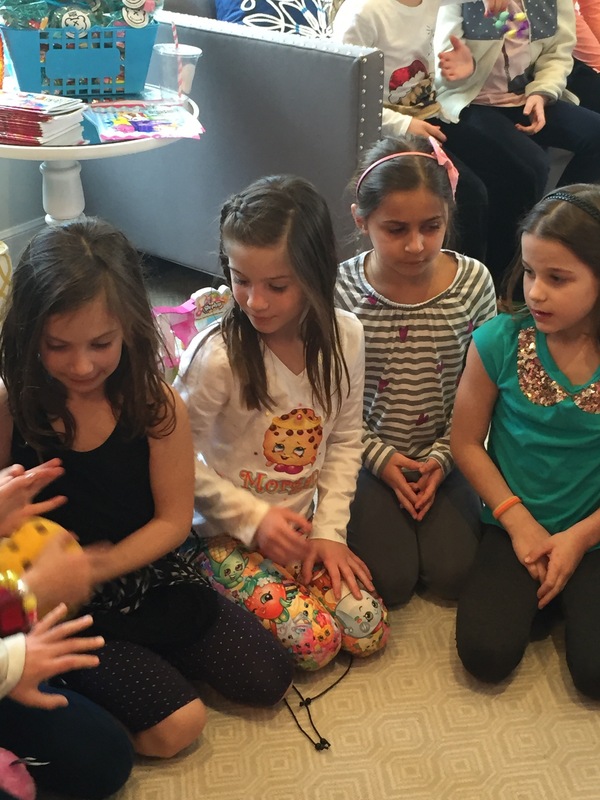 I found these super cute bracelet kits from Starlet Beads and Bows on Etsy and the girls each made a Shopkins bracelet to wear home. 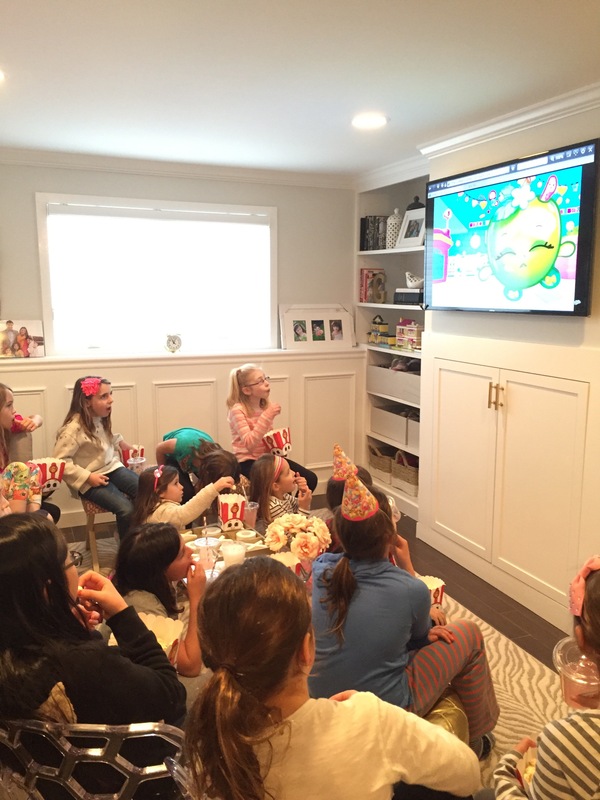 After making bracelets, the girls grabbed a box of Popcorn and headed downstairs to watch a few Shopkins cartoons I found on YouTube. 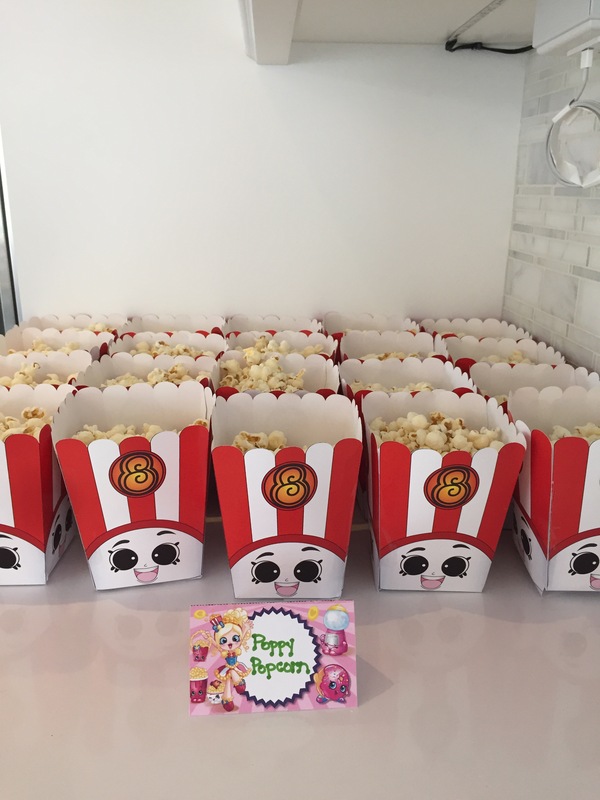 The adorable popcorn boxes were from SuperCraftDee on Etsy. 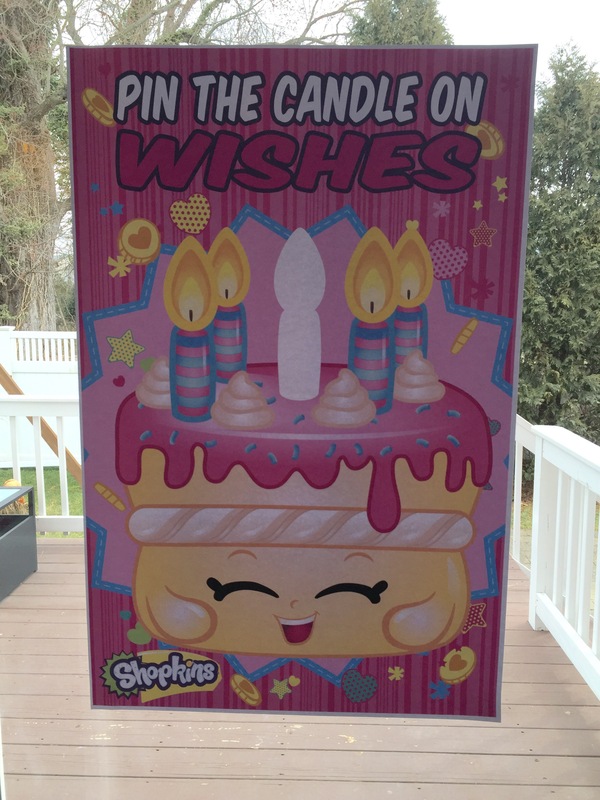 We also played a few birthday party classics like “Pin the Candle on Wishes” and Pass the Shopkin (like hot potato)! 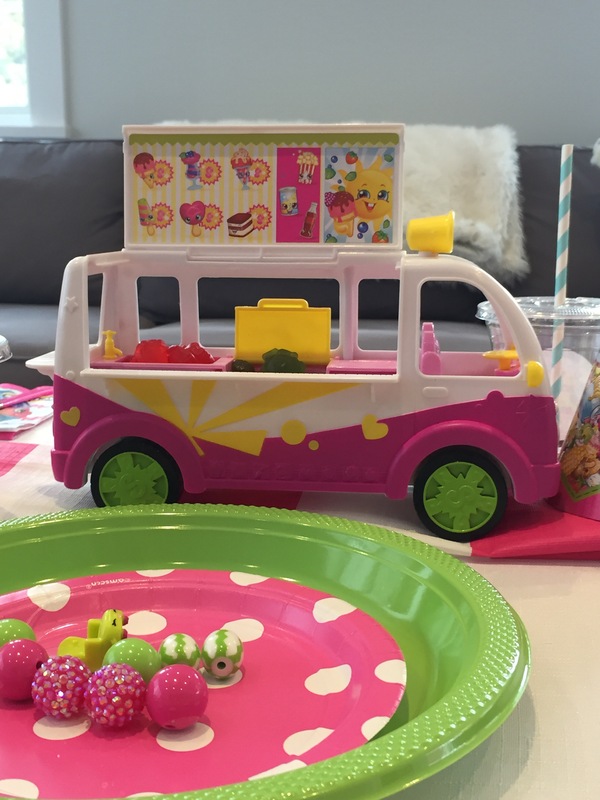 After all of the activities, it was time for lunch! 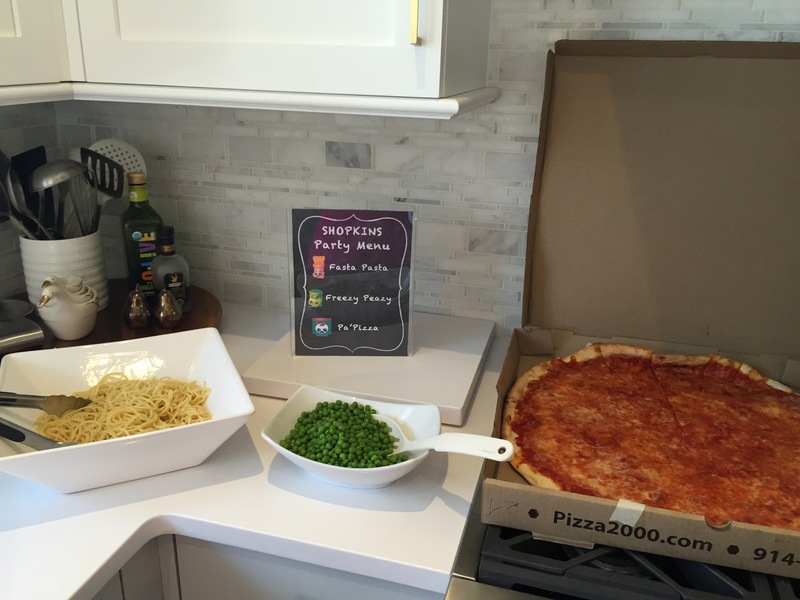 We enjoyed lunchtime favorites named after the Shopkins characters, Pasta Fasta, Freezy Peazy, and Pa’Pizza. 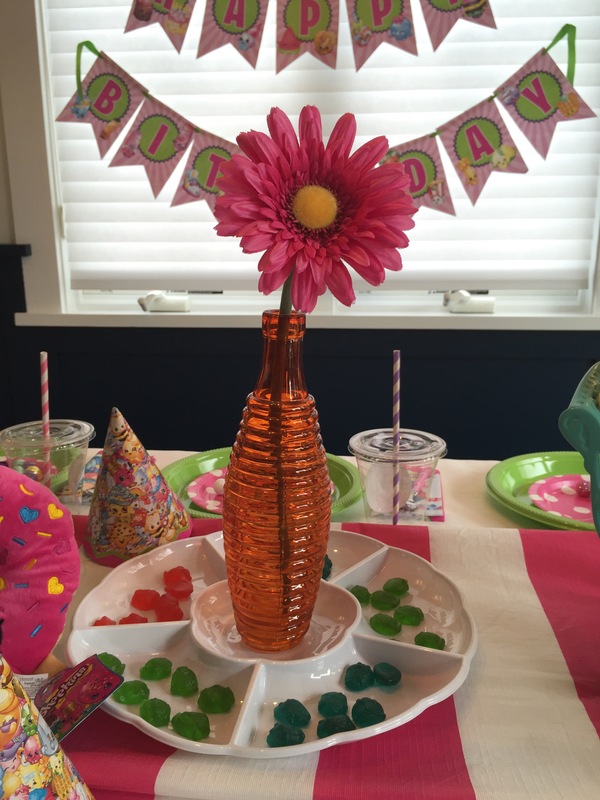 After lunch, we sang Happy Birthday to the sweet birthday girl and enjoyed treats from the cake table. 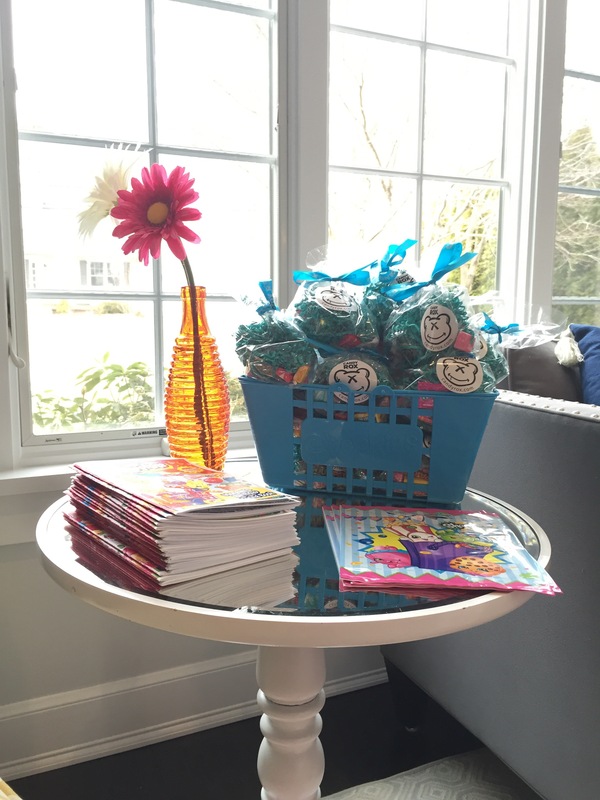 Each little party guest went home with a bag containing their own pack of Shopkins to add to their collection and some colorful candy, along with a personalized Shopkins coloring book. 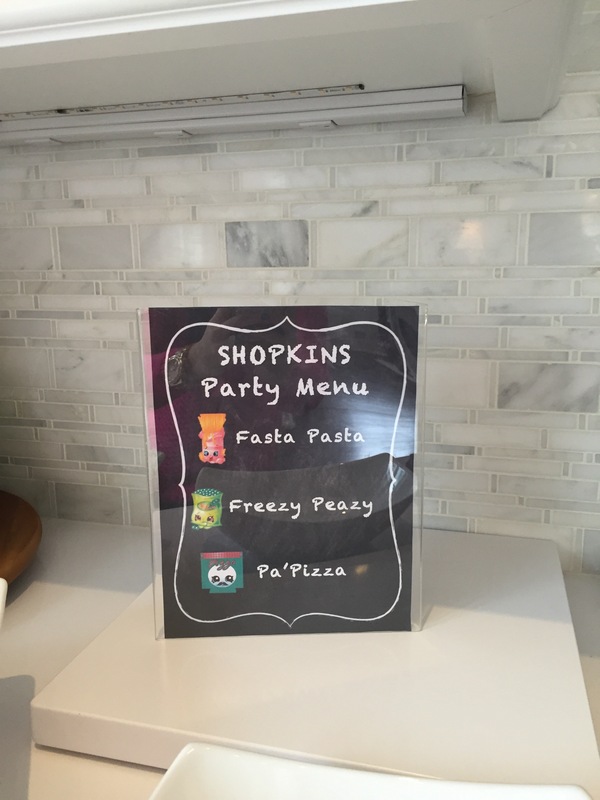 I found the adorable life-sized Shopkins storage basket on Amazon and it was perfect for holding the party favors. 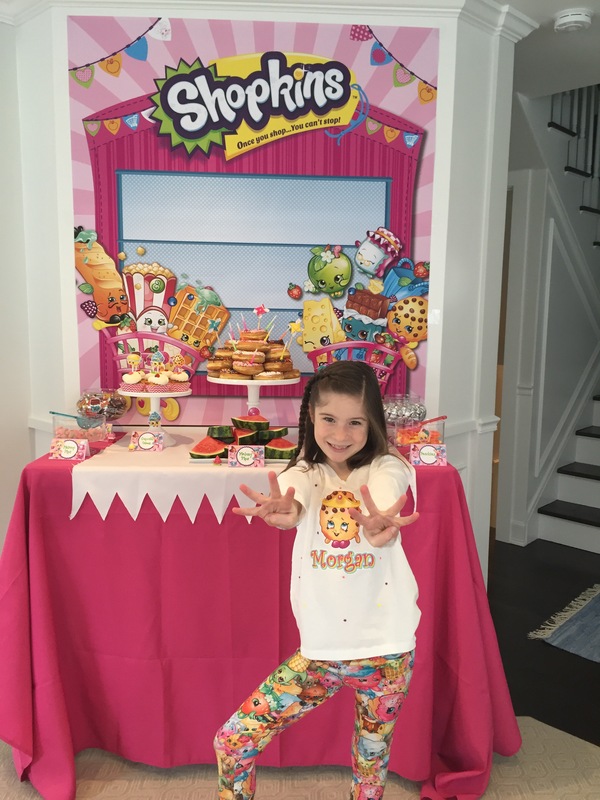 Morgan’s Shopkins Themed 8th Birthday Party was a success and surprisingly easy to put together! I know she’ll remember this one for a long time! 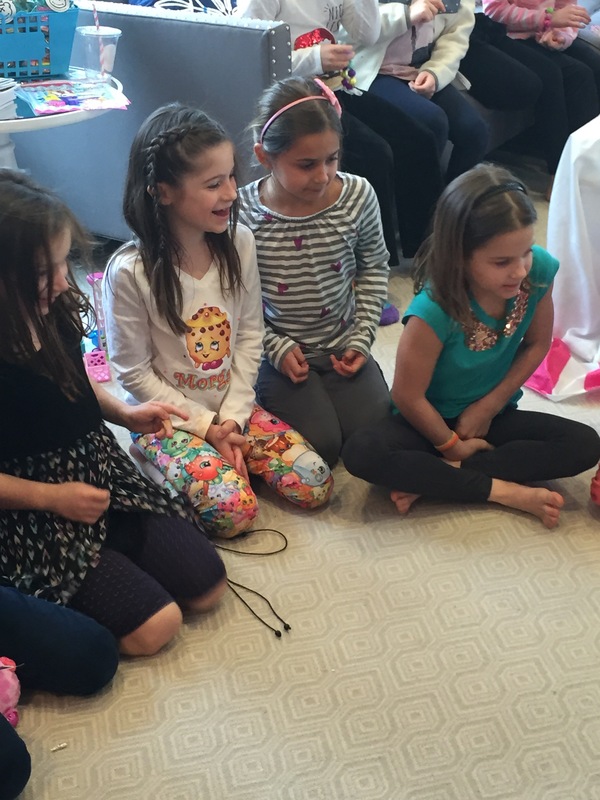 I hope you enjoyed it baby girl!